In the last week of July 2018, the Iranian regime addressed the annual gathering of ambassadors and diplomats in Tehran. Leaked information from representatives inside the regime has revealed that the main purpose of the talks, was to brief those in attendance on how to handle the recent arrest of the diplomat turned terrorist in Germany. The annual gathering of regime diplomats featured talks from Khamenei, Rouhani, and Zarif, as well as a whole host of the regime leadership, including Qods force commander Soleimani, Mahmoud Alavi from the Ministry of Intelligence, Interior Minister Rahmani Fazli, Defence Minister Amir Hatami, amongst others. At its core, the meeting was an opportunity to coordinate Iran’s diplomats, its Ministry of Intelligence, Ministry of Foreign Affairs, and Quds Force, and promote the shared goal of exporting espionage and global terrorism. The involvement of a regime diplomat in a failed attack on the Iranian opposition’s annual gathering in Paris prompted concern from governments around the world. The United States State Department is urging nations which house Iranian embassies to be vigilant to ensure their own country’s security. On July 2nd, Belgian authorities arrested a husband and wife of Iranian origin. The pair were travelling to Paris armed with 500g of homemade explosives and a detonation mechanism. In the subsequent days it emerged that Iranian diplomat, Assadollah Assadi, posted at the regime’s embassy in Vienna, had provided the couple with the explosive device, and the instructions to attack the annual gathering of the People’s Mujahedin Organisation of Iran (MEK) and National Council of Resistance of Iran (NCRI). In the wake of the foiled attack, the regime has come under fire from international governments who called the attack a “flagrant violation of the Vienna Convention”. According to insider sources, Zarif and Alavi briefed the diplomats on how to handle the international response to Assadi’s arrest. The pair stressed the effectiveness of psychological warfare and the dissemination of false information. The diplomats and ambassadors received instruction to make use of their connections with domestic intelligence units in their host countries and spread false and inaccurate information. The IRGC and Quds Forces have made attacking the MEK and NCRI a priority. 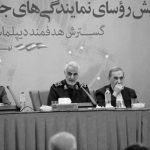 A recent internal report circulating within the IRGC stressed that a strike against the MEK was a “political, military, security, and intelligence priority of the regime”. It recommended targeting members on journeys and trips, using similar methods it employed in the 90s. The regime’s Quds Force is also allegedly exploring the possibility of deploying terrorist acts against the Iranian opposition using non-Iranian mercenaries. The annual gathering in Tehran also addressed the topic of how to justify Iran’s intervention in domestic conflicts across the Middle East to international governments and media outlets. 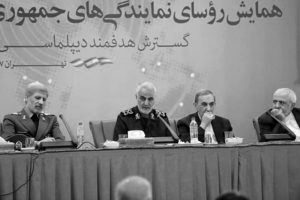 The regime’s intervention in Syria, Yemen, and Iraq with IRGC and Quds forces is drawing attention from the international press and is becoming a talking point within foreign governments.